Hire the top 3% of React.js development consultants. Toptal is a marketplace for top React.js services. 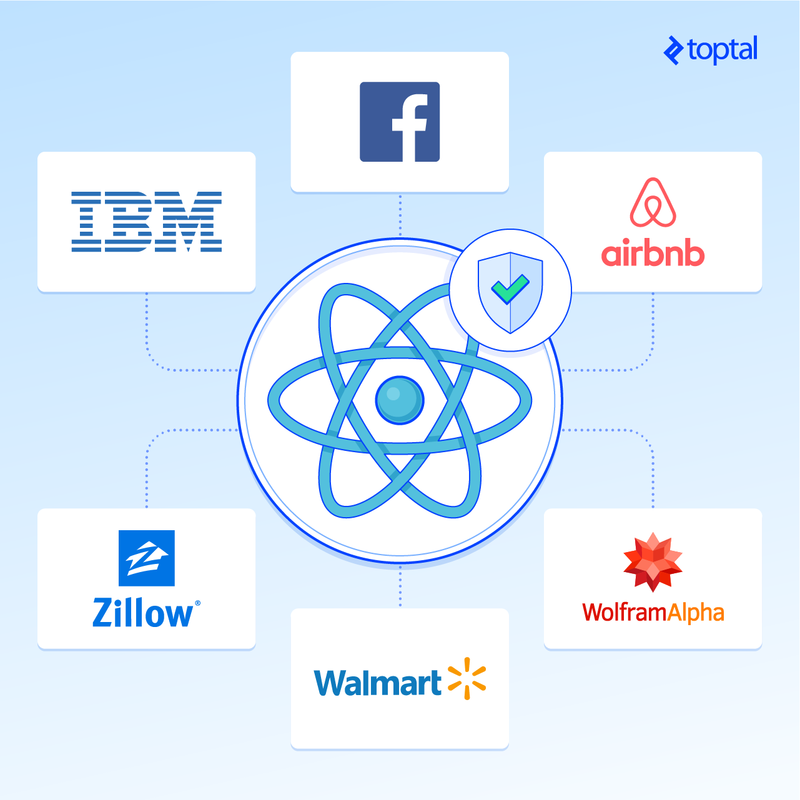 Top companies and startups choose Toptal’s React.js development services for their mission-critical software projects. Toptal helps you hire proven React.js freelancers on demand, from its elite network of experts. See why top companies and startups trust Toptal to hire top React.js development freelancers. Toptal is a marketplace for top React.js development consultants. Top companies and start-ups choose Toptal freelancers for their mission-critical software projects. Seeking new opportunities in software technology to share my knowledge on software projects related to design, architecture, engineering, and development. Kevin has extensive experience developing performant web applications using current technologies. Next to web development in general, he has a strong interest in native iOS and Mac development. He's comfortable working on his own, in a team setting, or as the lead of small teams. Emanual is a talented engineer with a passion for web development. He is an accomplished front-end web developer with more than eight years of experience. He has a keen eye for detail and a high level of creative efficiency. A developer since 2004, Jean-Baptiste has started his career mostly in the Microsoft .NET and in back-end world, but has migrated steadily over the last years to Node.js. He also has become increasingly interested in full-stack development. He's disciplined, focused, and result-driven. He takes pride in delivering quality, tested, and documented code. Besides Facebook itself, the number of high-profile companies using React is massive and grows daily, including Airbnb, Walmart, Zillow, Wolfram Alpha, WeWork, and many others. Maybe you’ve already been considering React. Maybe you’re planning a new project and want to know what all the hype is about. Or maybe you want to re-architect an existing application or implement some new features within a large app. Whatever your use case, we believe that React and its surrounding ecosystem will support that use case well and allow you to grow without the constraints usually found in legacy application architectures. This composability allows developers to build applications that are easy to reason about and maintain, and even allows non-technical users more visibility into the structure of an application. Since React has a small footprint and does not force an application architecture, it can be (and is) used alongside existing frameworks and libraries. It is common to see projects which implement different pieces in competing frameworks for various reasons, including the skillsets of available development talent and the interoperability of legacy technologies. Because of React’s simple design and fuss-free implementation, a variety of architectures can be utilized, and an incredible ecosystem of libraries augment React’s offering by introducing clean patterns for data management, network calls, internal event flow, and data structures. In fact, Facebook defines patterns, such as Flux, but simply describes the architecture and allows libraries like Redux and Alt to take over the implementation. Small libraries that work well together are more reminiscent of a Linux approach than a monolithic architecture. React programming itself is simple enough that its basic usage can be learned in a few days. Even if a developer is not utilizing the most ideal architecture and ecosystem libraries right away, React work can go into production almost right away, while combining legacy code (such as jQuery network calls or an existing Angular or Backbone application) with new React components. What this means is that over time, a React-based UI can morph into an architecture that is ideal for the unique business requirements at hand, rather than accepting the “square peg, round hole” approach offered by many monolithic frameworks. Now that you know a bit more about React programming, here are eight clear signs that you’re ready to hire a React developer. When an organization embarks on a new project, the first questions asked often revolve around which tools, frameworks, and libraries to utilize. For new web applications, React is the obvious choice for foundational code. Its flexibility, composability, and small footprint, along with the numerous strong libraries available for things like shared state management, form handling, network communication, Bootstrap support, etc. ensure clean, reusable code while maintaining your organization’s ability to remain flexible. In addition, the development tooling often paired with React is pushing the envelope in every way. The React ecosystem supports advanced concepts like hot reloading and data store interaction for more interactive development. It also features interactive React developer tools available collectively as a browser plugin. Just a few years ago, many developers were building applications that would interact directly with the DOM, i.e., they would use the browser API directly to update UI elements with new values. Imagine a list of stock tickers or other live feed of data, and imagine needing to control adding elements, removing elements, and changing individual elements from hundreds of data sources. This is an approach that is very difficult to maintain. This makes implementing applications with many data sources much simpler. You only need to worry about maintaining your application’s internal memory, and not about managing the rendering of the UI, which React conveniently abstracts away. A use case which we are hearing about more and more frequently is that companies want to reuse large portions of their UI structure and logic between platforms. React can also be rendered from the server, meaning the hard work can happen on your servers and be delivered to your clients fully compiled for rapid painting to the DOM. A big challenge for many organizations is that while they see the clear value presented by React and the accompanying ecosystem, they cannot justify throwing away existing code that works reasonably well. The good news is that a React application can both wrap or be rendered inside of an application implemented using another UI framework. The reason for this is that a React application instance is bound to a single DOM element. This DOM element can be within or wrapping another application framework. We have frequently observed React projects which wrap Angular code and vice-versa. Libraries have even been written to make this particular interoperability simpler. Granted, it’s ideal if your applications are developed with conceptual consistency—i.e., you don’t mix frameworks. But the reality of pressing business needs and the hours required to rewrite “code that works” makes this scenario all too common a requirement. Earlier we discussed React’s composability and how it makes React applications easier to structure and reason about. Another advantage offered by this composability is the ability to isolate system components into discrete pieces which can be individually tested. Most React components simply render based on a list of properties provided top-down, so testing the effect of modifying the props a component accepts is remarkably simple. Some React components also manage internal state, which can be controlled via a very simple API. This is also very easy to test. An outstanding library of test suites for React, such as Jest, as well as interoperability with existing testing tools, such as Karma, Mocha, etc., make React an easy choice. React can also be rendered without a browser—it is common to see React applications rendered from the server or inside a headless browser—which simplifies testing even further. As it gains more mindshare among developers and more footholds in organizations, it will become increasingly important that every organization have at least a toe in React, and some proficiency in developing applications with React and attracting React talent. Some of the smartest people in the front-end development community are building the tooling commonly used to build, support, and implement patterns within React architectures, and to say that your organization should consider exposure to them is an understatement. React and the architectural patterns commonly found in the best applications represent an evolution in web development practices that cannot be ignored. If you’ve been involved in many software development projects, you know that one of the most important parts of future-proofing your efforts is ensuring that your application can be supported for years to come. This stability means that when your team learns React, you can rest assured that this knowledge will be transferable and will stick around for years to come. In fact, Facebook’s own engineering integrity relies on it. Even IBM has blogged about React’s long-term maintainability. Besides the backwards compatibility and remarkably stable API, one of the main reasons React is more maintainable than other UI libraries is because of its incredible composability. As discussed previously, React components can be embedded within each other, rendered inside raw HTML pages, or bundled as standalone applications with their own bootstrapping process. This flexibility ensures that as your project evolves, you will be able to easily adapt at least the React part of your application to your requirements. React’s extreme composability will make things like full rewrites a thing of the past in yourcode base, as it is supremely easy to keep the good parts and isolate the bad parts. Because React components so frequently work in isolation, it is often very easy to hire someone to maintain another developer’s work, and make changes without creating system-wide problems. It is safe to call React and its accompanying ecosystem one of the most easily maintainable approaches in application development. The React community continues to thrive while pushing the envelope of modern software engineering. Development still proceeds quickly, and search volumes, job postings, and other measures of interest are showing no signs of diminishing. And yet it maintains a rare stability. There was once a saying in enterprise software circles in the infancy of the software industry: “Nobody ever got fired for choosing IBM.” This is the status React now enjoys in the software world. Postscript: How Do You Evaluate React Developers? Assuming you’ve seen the signs and decided to hire someone for React development, how should you find the best one for your project? In addition, you’ll probably want the candidate to have some working back-end knowledge, as many application development projects often require a tight communication loop between the API designer, the devops automation team, and the front-end team. Finally, the candidate should of course have a solid working knowledge of React. Things like JSX syntax, component lifecycle methods, higher-order components, and controlled components should all be second nature. This list of interview questions should help get you started with the technical part of interviewing a React developer. Enjoy!